A panel of white men did their best at this evening’s Question Time organised by MP Chuka Umuna to defend the decision to redevelop Lambeth College’s Brixton Hill site to include Trinity Academy and University Technical College. 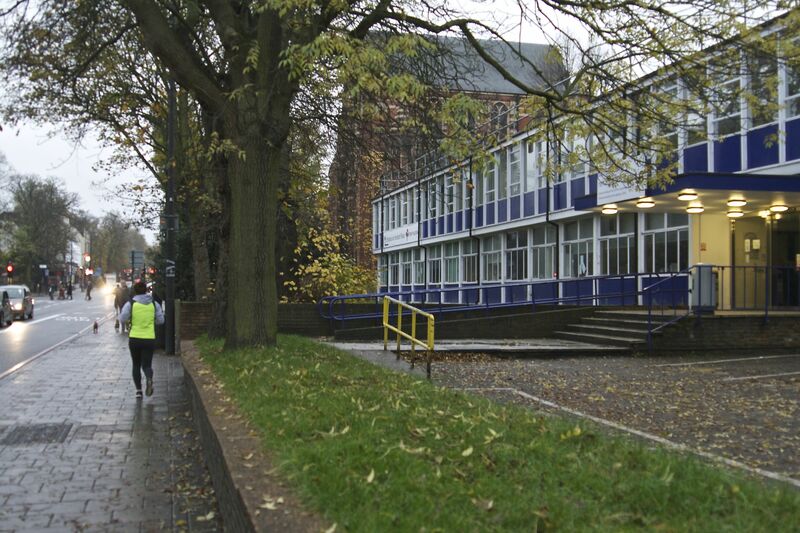 Only 30 percent of the site will remain for Lambeth College. Judging from the audience’s hostile reaction, they failed fairly completely and only dug themselves deeper into failure as the evening progressed. Near the end, the harassed architect did in fact say under pressure that nothing is set in stone until the actual plans are officially submitted to planning in the summer. I don’t think anyone there really believed him, but can Brixton residents hold him to his word? The general feeling from the audience was that they were deeply suspicious of everyone on the panel, and opposed almost everything about this development. From the architect and contractor, that they had only been on the project for three weeks and were simply working within a remit settled by the last lot of men in suits consulting at us. Everything has already been approved. They are simply there to design and build what will best provide for the needs of the three future users of the site. From our Labour representatives, that it is all up to planning now and can only be questioned or contested on that basis. They can’t sit on or influence the planning committee who will make the final decisions. 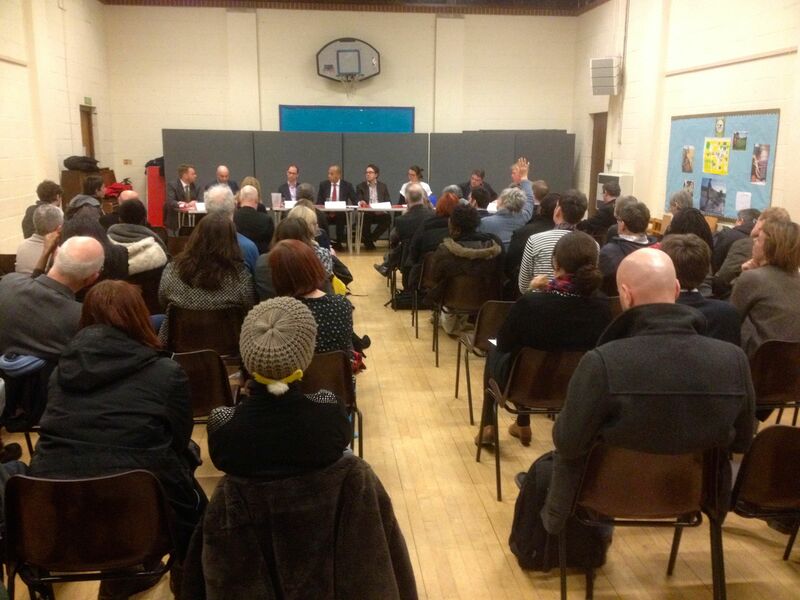 As one of the local residents who had participated in the first round of ‘consultation’ on this plan, submitted written comments, written to Chuka Umuna about my feelings, and yet never received any updates or notifications of further meetings (including this one), I could understand the anger and frustration in the room. Malcolm Dodds – Senior Advisor for the Baker Dearing Educational Trust that exists to promote and support new University Technical Colleges (This trust was founded by Lord Baker and Lord Dearing to facilitates a key Tory policy, probably all we need to know though I’m sure there’s more to look into here — there’s more on the UTC model, along with Academies and earlier protests here). Daniel Trigg – Senior Project Manager at Mott MacDonald, the contractors on the project. Mandy Brown – UCU branch Secretary at Lambeth College. She found out about the panel and the list of men on it who are all in full support of the development and asked why there was no trade union representation from the college. She was then invited to join by Chuka’s office. She showed up in her Save Cressingham Gardens T-shirt, which was a nice gesture. Negative equality impact on the community — a majority of students go there for special provisions for the disabled or ESOL and there continues to be a huge need for both, especially as other places like Croyden have cut back ESOL and their students are coming to Brixton. She got a solid round of applause for this, the first to be heard. The questions raised a lot of practical issues. How many users will there be on site? Their estimates are 420 full-time-equivalents at Lambeth College, 600 students at the University Technical College, 840 students at Trinity Academy. Further questions clarified this could be as many as 3000 a day as most Lambeth College students are there part time. Questions were raised about the fate of disabled students, who Lambeth College has historically made a tremendous effort to serve. Mark Silverman assured everyone they would not be forgotten. Of course, he went on, the government has made another round of cuts, and Chuka mentioned that apparently though not yet announced, the projected figures for the latest coalition government budget will put the viability of a number of adult colleges at risk. That might have been the worst news of the evening. A number of comments and questions targeted Trinity Academy, no one seemed happy with its presence. One set of questions dealt with its viability under a new government, others mentioned how they are shown to be socially divisive, ineffective and sometimes harmful, they don’t have the same requirements to provide trained teachers. Others questioned the fact that a school with a Catholic ‘ethos’ should be receiving public funding, even when not supported by the Catholic Diocese itself — and they wanted some clarification around that. Sara Tomlinson of the NUT echoed that free schools have been a failed experiment and only last week another closed down. 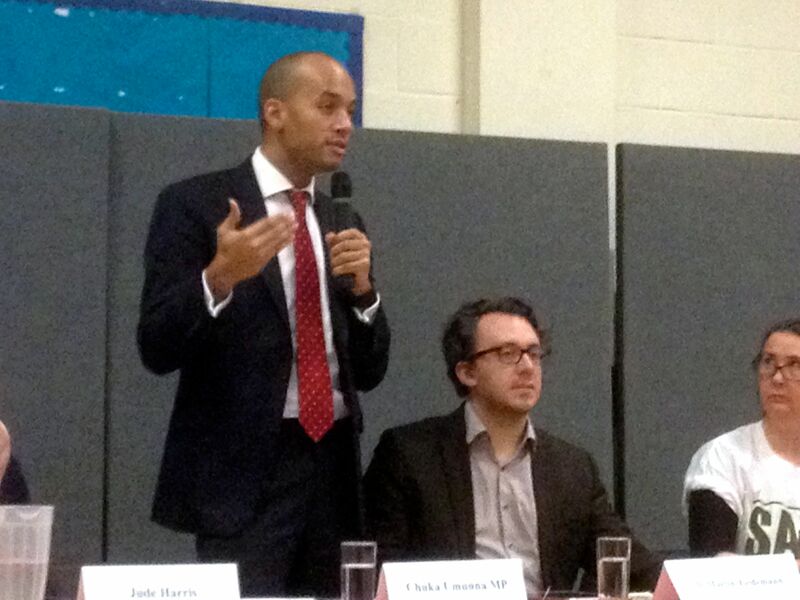 Chuka was asked what Labour meant to do about them. Very politically he responded that while he had nothing against the staff or students, their opening would not be supported under Labour, and he supports a rationale that puts schools where they are actually needed. Trinity Academy is not needed. I’m not sure Cllr Tiedmann agreed with him, but his support of Catholic schools and education in general was a little muddled. 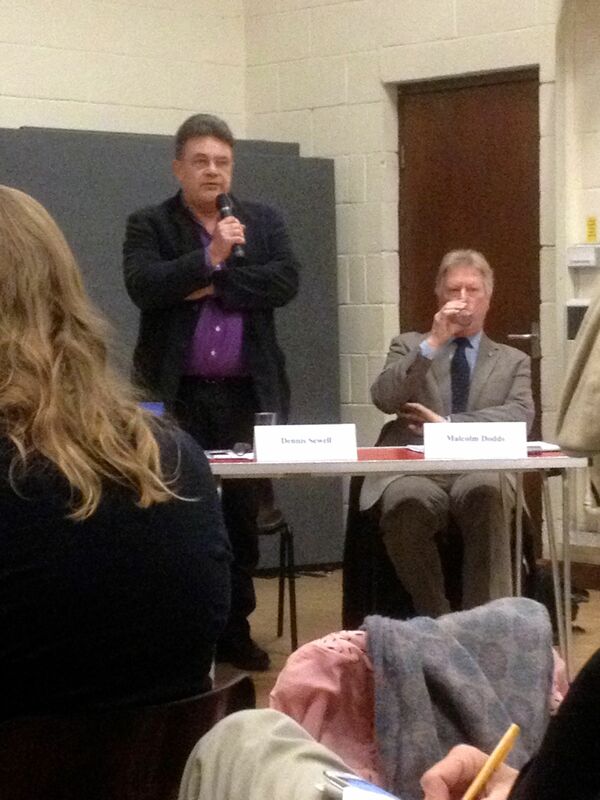 Unjum Mirza (TUSC candidate for Streatham) declared Labour spineless and called out Dennis Sewell’s comments in the Spectator and asked whether a racist bigot should be running a school in Brixton — now that sent a ripple through the audience. Question Time was running late, so a last rush of questions was taken — mostly along the lines of ‘what do you mean you’re going to have three schools all in that small space?’ and ‘there has been no real consultation’ and ‘how can we have any kind of real say in what happens with this?’. At hearing there might be a building of 5 to 6 stories on the site pandemonium broke loose. The panel were asked about their strategies for racial equality — not just in the construction but in their teaching and learning models and how they work with the BME community. The usual platitudes were produced, but in defending the grand aims of Trinity Academy Sewell made the mistake of saying that that there was too much social and ethnic segregation in local schools, and that set pandemonium off once again. It really was a great crowd who deserved better. An unfortunate comment about the Academy not having enough White British students and it was really all over for him. 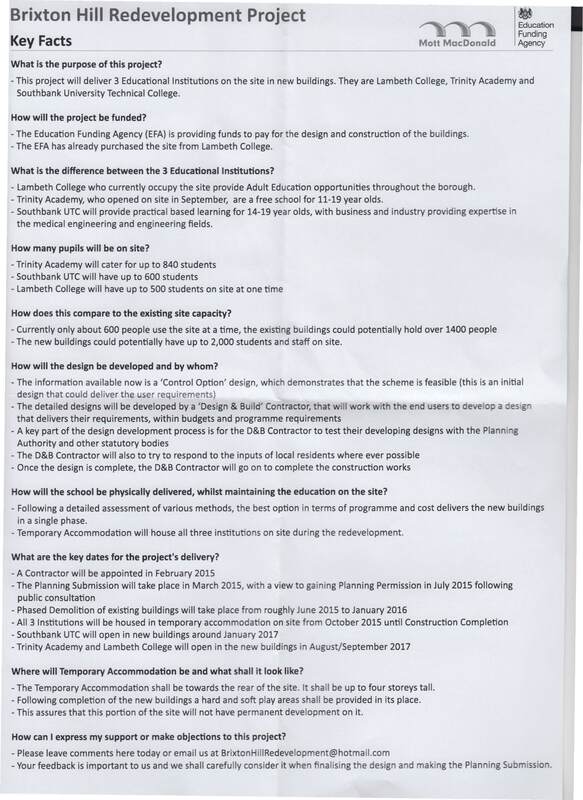 The next round of ‘consultations’ should take place at the end of the month, where Justico & Wilds and Mott Macdonald will present a range of actual plans (will they be the ones already shown parents of children at Trinity Academy? There is as yet not date or website, but we should expect one. Previously posted on Brixton Buzz. Discuss this on the urban75 forums. Held on Wednesday and announced in the Brixton Blog, it was what I should have been expecting. I thought it might have been more like a meeting, but was actually a small room with about six professionally done schematics and some artists renderings of what the new buildings as a whole might look like hanging on the wall. There were smiling white men in suits, very nice and friendly and anxious to answer any questions we might have. While I was there they outnumbered the community members present. Lambeth College is almost entirely gone. I knew that was what they were planning — in spite of our protest’s earlier ‘victory’ in saving the site for education rather than development as luxury flats, in spite of assurances that Lambeth College is staying in Brixton. Perhaps being bought by the Department of Education was the worst possible outcome given the Tories’ ideological onslaught against public education. Lambeth College was here reduced to a small yellow rectangle engulfed by Trinity Academy and the South Bank University Technical College (SB UTC), neither of which we need here though our other needs are very great. While many people there had been informed through leaflets distributed among those living immediately next door and were very concerned about the height of the new building and the construction (and rightfully so), my own concern as a slightly more distant neighbor was primarily the new use for the land. So first the issues with Trinity Academy. There is of course a string of hard and repulsive facts about academies in general: academies are failing their students and providing inadequate education, they have been shown corrupt in their dealings with Ofstead (and buying designer tea sets), aren’t hiring qualified personnel, and are being fought tooth and nail by local parent groups along with students and teachers. There has been some brilliant research done on who the politicians are who are pushing academies, and their links to the people who are profiting off of them here, and an array of well-researched briefings to be found here, collected by the Anti Academies Alliance. All in all they seem like one giant land and profit grab by people trying to make money off our children, while also taking over public resources. The borough estimates it already has 226 spare places in its schools. An insult really, to a borough reeling from budget cuts and the ongoing slashing of budgets for all teachers and youth workers across the borough, with shortfalls being made good by the eviction of long-term residents in so-called shortlife housing so their artisanal Clapham homes can be flogged off in a process of social cleansing. The artist’s drawings of the new site show only Trinity Academy, a new four-story building with the giant logo highly visible along the side of it. I was a little sick. In them all the greenery now in the frontage of the school is also gone, the trees cut down, so the building comes right up to the pavement. and is independent from local Authority control. They are sponsored by a University, but the staff are not required to have the same level of expertise or training, and several UTCs can be run by the same board of directors. Essentially it’s the flawed academy model with lower standards and less public oversight (or any oversight at all). They are offering highly specialised education that starts at 14, by 16 children are supposed to make ‘an informed decision’ about whether they want to specialise in medical or building engineering. There might be a few children capable of deciding that all they want to be is a radiographer at age 14 when they enroll in this place, but this level of specialisation this early seems set up to entrap students into ‘career’ tracks of their parents’ choosing. Because the focus is employability and skills development, it also means they are not geared toward higher education (though the possibility of this is maintained throughout the document in glowing language), thus entering their ‘chosen field’ at the very lowest level of qualification, leaving top level jobs with advancement possibilities to those who follow the higher track of education. During the year it is anticipated that all students will undertake a period of several weeks of volunteering work during one of the extracurricular sessions. It seems so cynical to me to have this kind of institution where a college used to be, taking advantage of local community fears of unemployment and parent’s need for something to do with their kids during working hours now that all children’s services have been destroyed. They’re doing this to channel local youth into technical jobs that will always have ceilings without higher education. Clearly this is targeted at poor kids and Black kids, the ones being failed by our current education system and blamed for it, the future drones of Britain.